Salaam Reads / Simon & Schuster Books for Young Readers, 9781534426085, 288pp. Hanna Alkaf graduated with a degree in journalism from Northwestern University. Her work has appeared in Shape, Esquire, and Marie Claire among others. She lives in Kuala Lumpur with her family, and The Weight of Our Sky is her first novel. * "This stunning debut from Malaysian author Alkaf filters Melati’s sympathetic internal narrative through a mental illness barely understood and poorly treated for the era, and the setting and secondary characters convey a visceral, nerve-wracking moment in time. This isn’t an easy story by far; an author’s note warns of “graphic violence, death, racism, OCD, and anxiety triggers”—but their inclusion makes it no less essential, no less unforgettable." "Melati’s growing strength gives hope to readers: If she can fight her inner demon and save the day, then they can, too." * "This is a brutally honest, no-holds-barred reimagining of the time: The evocative voice transports readers to 1960s Malaysia, and the brisk pace is enthralling. Above all, the raw emotion splashed across the pages will resonate deeply, no matter one's race or religion. Unabashedly rooted in the author's homeland and confronting timely topics and challenging themes, this book has broad appeal for teen readers." * "At the sentence level, Alkaf’s use of first-person narration expertly (and, in some cases, painfully) places readers inside Melati’s head as she experiences internal and external horrors....Echoing ­contemporary race relations, the subject feels especially relevant. VERDICT Alkaf’s immersive, powerful writing make this a must-purchase for all YA collections." "Alkaf offers a gripping fictionalized account of the 1969 post-election riots in Malaysia, limning acts of bravery and tolerance that unreel alongside the slaughter perpetrated in the Kuala Lumpur streets." 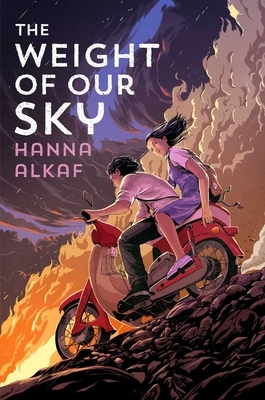 "With her debut young adult novel, The Weight of Our Sky, journalist Hanna Alkaf provides heart-pounding, graphic insight into the seismic life shifts experienced by residents of Kuala Lumpur in the days directly following the May 1969 Malaysian Riots."